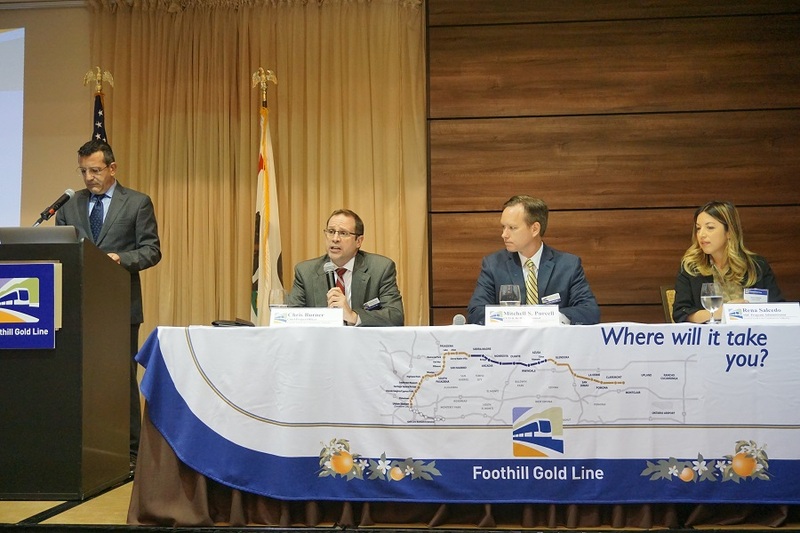 From left, Habib Balian, CEO of the Foothill Gold Line Construction Authority; Chris Burner, Chief Project Officer; Mitchell Purcell, Chief Contracting Officer & In-House Counsel; and Rena Salcedo, SBE Program Administrator of Foothill Gold Line Construction; provided project updates and upcoming business opportunities stemming from the next leg of the Gold Line project that will extend from Glendora to Montclair. MONROVIA, Calif., May 31, 2017 — Nothing turns out a crowd at 8 a.m. quite like free coffee, tea, pastries, breath-mint tchotchkes … and the opportunity to win a piece of the nearly $1.4 billion in business up for grabs when the six-station Foothill Gold Line light rail project from Glendora to Montclair breaks ground in October. 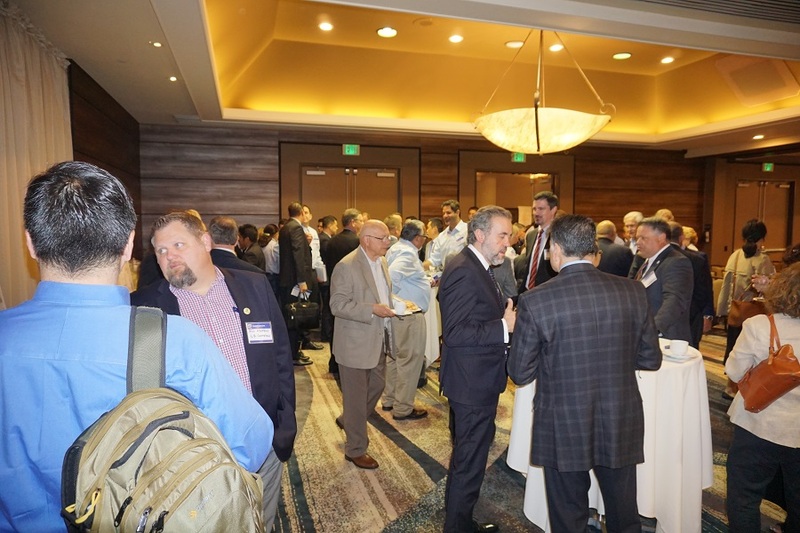 The Wednesday morning event, dubbed the Foothill Gold Line Industry Workshop, drew to the DoubleTree Hotel in Monrovia more than 200 small business representatives and prime contractors interested in upcoming business opportunities with the Foothill Gold Line Construction Authority. Construction Authority officials stepped attendees through the various procurement processes and timelines. Attendees also learned about the Construction Authority’s Small Business Enterprise (SBE) program, which has a goal of 16.6% participation by SBEs in all contracts. Rena Salcedo shares some of the upcoming small business opportunities with more than 200 contractors and subcontractors in the audience. Two significant contracts will be procured in the next 18 months by the Construction Authority for the project – (1) Utility Relocation design-bid-build contract and (2) Alignment design-build contract. The Requests for Bids (RFB) for the Utility Relocation contract will be issued in July 2017, with the contract award anticipated in September 2017. The Request for Qualifications (RFQ) for the Alignment contract, the first step in a multi-step procurement process, will be issued in November 2017, with short-listed teams determined in February 2018. 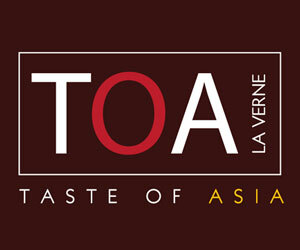 Short-listed teams will then receive the Request for Proposals. The massive project, which will include construction of two dozen at-grade or street-level crossings, multiple bridges and parking lots, including one in La Verne for 600 spaces, will require expertise across a vast spectrum of specialities, from in the installation of water, sewer, power and communications lines to framing, masonry, flooring, roofing, drywall and finish carpentry to engineering, landscaping and graphic design services. When the 12.3-mile extension is completed, the entire 37.5-mile Metro Gold Line will run from Los Angeles to Montclair, giving San Gabriel Valley and Inland Empire residents and businesses a freeway-free, light-rail option to reach downtown Los Angeles. 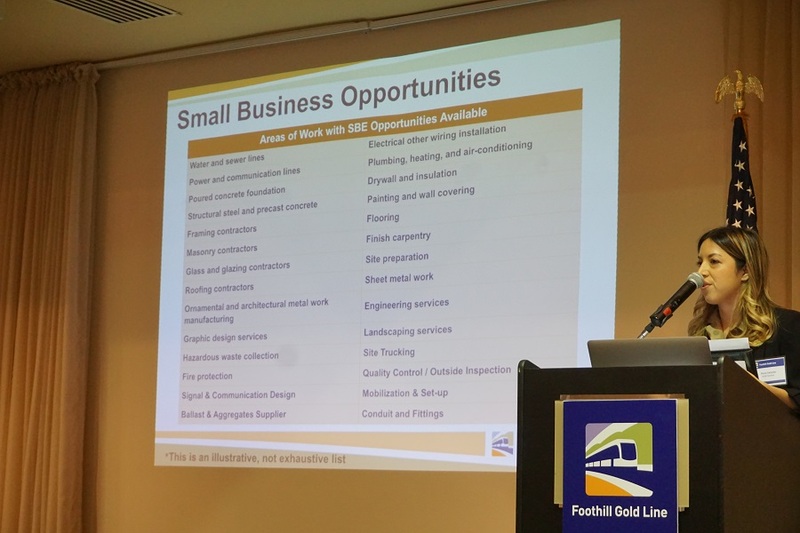 More information on the contracting opportunities with the Foothill Gold Line Construction Authority can be found by visiting http://www.foothillgoldline.org/contact_us/contracting-opportunities/. The workshop drew a crowd and created lots of conversation.